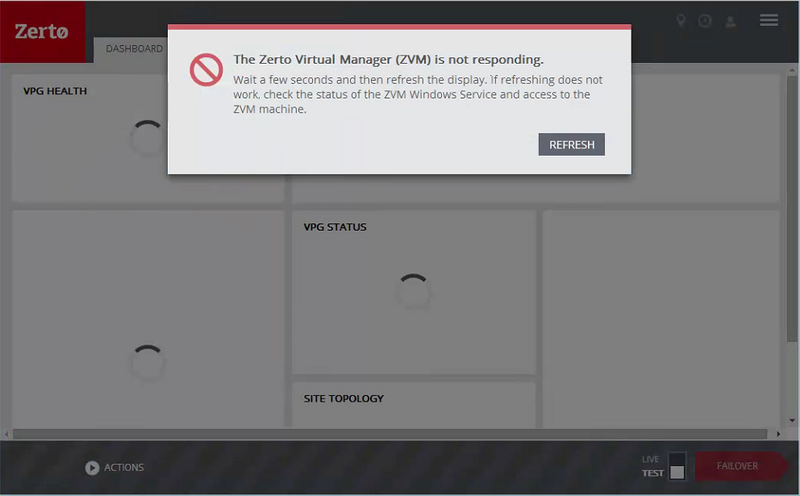 Zerto Virtual Manager user interface is not loading any elements. An NSX network is presented to the VMware architecture and the NSX network is presented as an Opaque Network. Paired ZVM may show a site disconnection alert despite the being no actual network or connectivity issues. The Opaque Network object present in a VMware architecture breaks the Zerto data collection mechanism for VMware. This mechanism is referred to as the reflection. When this mechanism breaks the ZVM it is not able to gather data about the available resources, nor share this data with its peer sites. The inability to synchronize the reflection can lead to a state where all ZVMs paired to the affected ZVM appear to be bouncing between a synchronizing and site disconnected state with the affected ZVM. The sections of this error that are not in bold can change based on what is currently being queried from the vCenter server by the ZVM. Separate the environment into 2 network segments. One network segment will contain the NSX-T switch, the other will be a traditional VMware network (referred to as NSX-V) that has no visibility to the NSX-T switch. Remove the NSX-T interface that is presented by vCenter as an Opaque Network from the virtual architecture.